Cryptos seem to have bottomed out with Ethereum leading the charge. Technical levels are finally looking better. Cryptos are finally rising. Bitcoin marked a double-bottom instead of another lower low. Ethereum is surging and Ripple is also on a roll. News that SEC Commissioners said he thinks regulators will eventually approve a Bitcoin ETF may be behind the rally. Perhaps the upcoming delayed deployment of Constantinople for Ethereum is the reason. In any case, long days of listless downdrift may be nearing their end ahead of the weekend. Are cryptos ready to rally? The technical picture has certainly improved, with more support than resistance seen on the charts. Bitcoin climbed over a substantial resistance level. At $3,402 we find a dense cluster of resistance lines including the Simple Moving Average 5-1h, the Pivot Point one-day Resistance 2, the Fibonacci 23.6% one-week, the Bollinger Band 15min-Middle, the SMA 5-1d, the BB 1h-Upper, the SMA 10-15m, the Fibonacci 161.8% one-day, the SMA 5-15m, the SMA 200-1h, and the Pivot Point one-day R3. The next support is also significant and close by. $3,370 is the convergence of the Fibonacci 23.6% one-day, the Fibonacci 38.2% one-day, the SMA 5-4h, the SMA 10-4h, the SMA 50-1h, the SMA 100-15m, the BB 1h-Middle, the SMA 200-15m, and the Fibonacci 61.8% one-day. Resistance lines are few and far between. At $3,636 we find the Fibonacci 38.2% one-month and the Bollinger Band one-day Upper. The ultimate target is $3,831 where see the Fibonacci 61.8% one-month. Ethereum is the leader of the rise and it has surpassed quite a few critical levels. Most notably, $105.30 is where we find the confluence of the SMA 50-1h, the SMA 200-15m, the BB 4h-Middle, the SMA 10-4h, the Fibonacci 61.8% one-day, and the Fibonacci 23.6% one-week. The most significant support is at $102.50 where we see the Bollinger Band 4h-Lower, last month's low, and the Pivot Point one-day Support 2. Weak resistance awaits at $110.45 which is where the previous 4h-high and the Fibonacci 61.8% one-week converge. The upside target for ETH/USD is $116.50, where we see the Fibonacci 23.6% one-month. 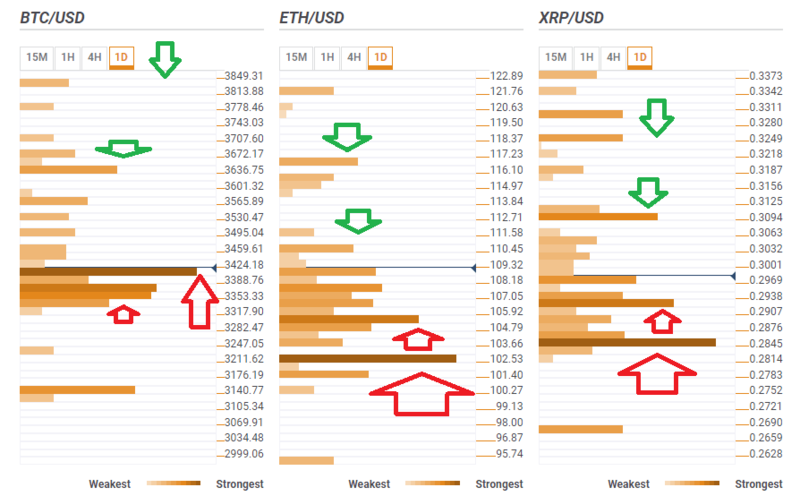 Ripple has more significant resistance than its peers, but this is nonetheless weaker than support. Support for XRP/USD awaits at $0.2922 where we see the confluence of the Fibonacci 61.8% one-day, the SMA 10-4h, the SMA 200-15m, the SMA 50-1h, the Fibonacci 38.2% one-day. The most significant support awaits at $0.2845 which is a dense cluster including last month's low, the Pivot Point one-week Support 3, the BB one-day Lower, the Fibonacci 161.8% one-day, and the BB 4h-Lower. Resistance awaits at $0.3094 where we see the confluence of the Fibonacci 23.6% one-month and the Bollinger Band one-day Middle. Further resistance is at $0.3250 which is where the Fibonacci 38.2% meets the price.